Kiwi growing is actually a very fun and engaging activity you can do by yourself or with your family, especially your kids, all year round. However, like any other kind of vegetation, kiwis and their vineyards require proper care for them to bear a lot of fruits and flowers. There are different types of kiwis all over the world, and some are even grown in California as well as China. Thus, the fruits have the ability to survive in varying temperatures. However, you will produce the greatest yield if you can match the fruit variant to the season. For example, the hardy kiwis survive in New Zealand, where there’s enough shade even during hot climates. Kiwis need sandy loam, though they struggle in clay. They have to be not only moist and deep but also well drained. It’s highly recommended that you water the newly transplanted vines regularly, but once you can see them taking hold, you can then slow down a bit. Watering also ensures the soil remains moist. If your area experiences harsh summer at time, it’s best if there’s an excellent irrigation system in place. Smaller vineyards can also benefit from them. Wind is one of the greatest enemies in kiwi growing. The flowers and leaves of the plant are very fragile, and they can easily give in to very strong winds. In regions where winds are strong, installing windbreakers may be able to solve the problem. Farmers should also watch out for light frosts, as they can give undue damage to the leaves of kiwis. When applying fertilizers, a small amount should be used during the early parts of summer or spring to avoid burning. Ideally, you need an ample space for kiwi growing. In fact, some kiwis can grow as high as 10 to 30 feet. 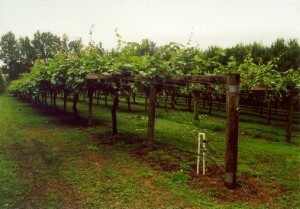 Male and female vines should be spaced between 10 and 18 feet. Today, though, it’s common among homes to have kiwis in their gardens. To do this, you can use a T-bar trellis. Fashioning them into an arbour or letting the vineyards grow on pergolas is perfect for aesthetic reasons. Since kiwis don’t produce fruits and flowers on their own, they have to depend on pollination, particularly with the help of insects. Thus, you should never forget to plant both male and female vines. Kiwi growing should include planning for pruning. This ensures that the plant is well taken care of and produces abundant flowers and fruits. Your plan, however, depends on the climate. If you’re living in a cooler region, a lot of pruning for males should be performed during the summer. In warmer areas, hold yourself from pruning during fall and spring since too much sunlight from burn the plant. 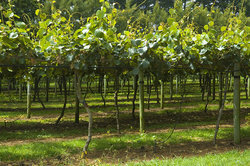 Kiwi growing plans include harvesting. Before harvesting a lot, obtain a few and allow them to become soft. That would take a few days. When they taste sweet, you can harvest the rest and place inside a cooler area, such as refrigerator. fertilization can be done in early summer.